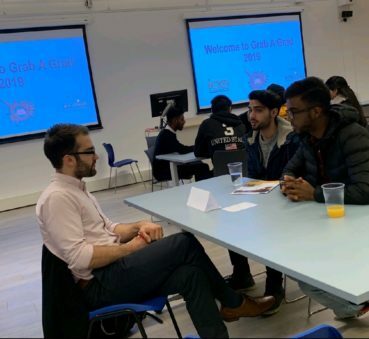 One of our team, Diego de Armas, travelled to Brunel University yesterday to speak to undergraduate and masters students about construction projects, chartership, engineering job applications, office culture, work-life balance, making a strong first impression, personal experiences at consultancies of different sizes, and experiences in both the Transportation and Buildings sectors. It was great to see such a good turnout and plenty of enthusiasm from the Brunel students. Congratulations to ICE London Graduates and Students and Brunel CivSoc Student Society on the organisation of this successful event! Great weather for a site visit to Pier House by Kew Bridge! 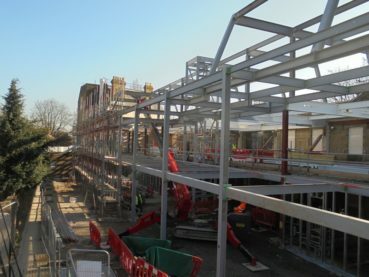 Reconstruction and extension of this building following the 2016 fire is now taking shape with the steel frame nearing completion. Great to see this building being brought back to life on the edge of the Kew Gardens UNESCO World Heritage zone. Pleased to be working with EPR Architects (to planning), Gibberd Ltd (site) with Thomas Sinden as contractor. Work at Huguenot Place is progressing where we are upgrading and extending a former Victoria Brewery that has been converted to offices. 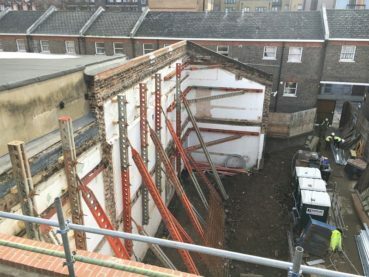 The demolition of the East Block has revealed the temporary works which have been designed to retain the original brick wall while the construction of the new internal layout takes place. This system features vertical and horizontal Slimshor braces resin anchored to the brick wall and fixed to mass concrete footings bearing on the ground. We want to do well by doing good. 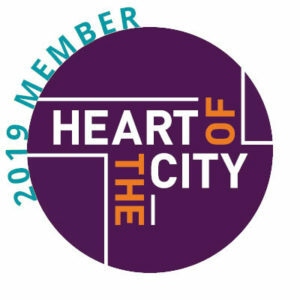 This year we’re proud to be members of Heart of the City – they’re supporting us to develop a responsible business programme that will help us have a positive impact on people, places and the planet. During 2019 we’ll be developing activities around connecting with and supporting our local community, making sure our business practices are environmentally friendly and improving our workplace for employees. We’re excited to keep you updated with what we’re doing! Following the start of construction in spring, the RC frame for this surgery & apartment block has already been completed. The key feature of the design was a large overhang from the second storey upwards – this structural challenge needed to be overcome as the foundations had to be kept away from the existing services in the ground, whilst a minimum floor area had to be achieved above to guarantee economic viability – which literally meant different parts of the building needed to be balanced! Also, the zig-zag masonry façade required a robust line of support and needed to be practical to build with all the different geometrical configurations. Therefore, a design was conceived where the slab edge follows the zig-zag pattern which could also be built with standard formwork. Work at Forster House is progressing. 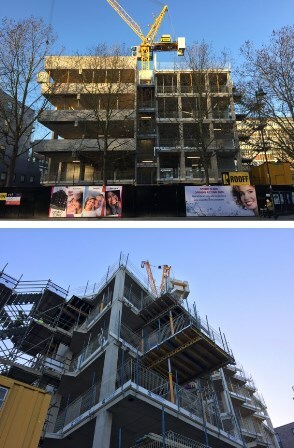 The first and second floor reinforced concrete transfer decks and the CLT superstructure frame is now complete. 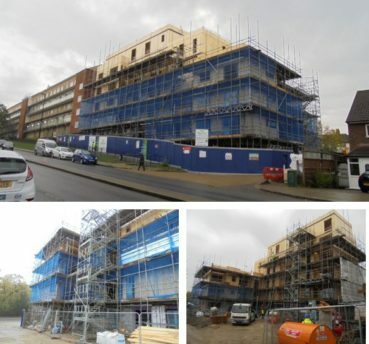 Windows are being installed into the CLT, ground/first floor external leaf brickwork has started and the roof felt is due to be installed to provide a watertight building. Further civils works to be built include a traditional RC retaining wall to the access road, tarmac and block paving and the Sustainable Urban Drainage (SUDs) measures, including storm water attenuation amounting to 58 cubic metres is due to be installed in the New Year. Overall completion of the project is expected by end of May 2019.